Actually I am not but I am kind of thinking about it after spying Courteney Cox’s retreat is this month’s Elle Decor. Perched high above the Pacific on two acres of land youâll find guest cottages, tennis courts, screening room and a saltwater swimming pool.Its actually one of the loveliest celebrity homes I have seen in a long while â unpretentious, laid back and glamorous with a fabulous selection of art I am jealous. 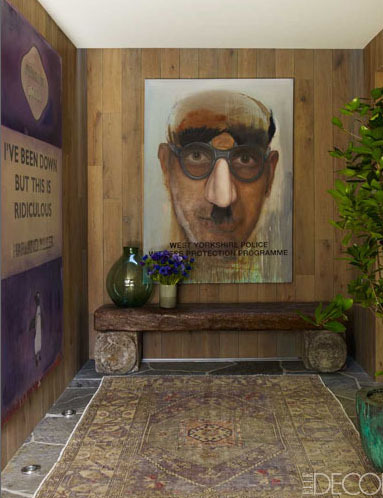 The entrance way – love loveÂ love the art, adore the rug and the panelled walls. This is the master bath – interesting but subtle use of texture and colour. Nothing is over the top instead its understated, earthy and sophisticated. Heavenly. I need to book a vacation right now.